Can someone please help me find the cause of death of Lt William Patterson Jamieson, C Bn Heavy Section MGC. He died on 6 Apr 17 and is buried in Tilloy British Cemetery. Both Soldiers Died in the Great War and the Registers of Soldiers' Effects have "killied in action" (ancestry). He has probate in both England and Scotland. I will see what else I can find. Edit: There is a three line obituary in the Scotsman of 12 April 1917 which only says "(killed)". There is also an entry in the Deaths Column of the same edition saying "fell in action". In the C Bn History he is listed as a casualty "incurred during, and in connection with, the action". "Captain Nicol Jamieson, 4th. R.S.F., who is reported killed at the Dardanelles, was a son of Provost Jamieson, Darvel. He was educated at Morrison Academy, Creiff, where he was gold medallist in 1900, and afterwards studied languages for a year in France, Holland, and Belgium. He joined the Territorials in April, 1902, and passed his examination in August of the same year; after which he was gazetted Lieutenant, and in the following year, gained his certificate as Captain. He was a member of the 4th. Battalion R.S.F. shooting team, and in 1913 he shot for the Ayrshire officers in the county competition. Captain Jamieson was well known in Rugby football circles. He played the game for seven or eight years, taking part in the trial matches for the West against the South and the North and the East, and was for some time Captain of the Kilmarnock Rugby Football Club. He was an enthusiastic Freemason and for several years held the position of R.W.M. in Darvel Lodge, No. 971. He was also a Royal Arch Provincial office-bearer and a Past Provincial office-bearer, and had taken his 18th. degree in the craft. He was a director of Alexander Jamieson and Company (Limited), lace manufacturers, Darvel, of which company his father, who has been Provost of Darvel for many years, is chairman." The brothers are named on the Darvel War Memorial in Ayrshire. CWGC - JAMIESON, Nicol. Rank: Captain. Date of Death: 13/08/1915. Age: 32. Regiment/Service: Royal Scots Fusiliers 4th Bn. Additional Information: Son of Alex and Margaret K. Jamieson, of The Braes, Darvel, Ayrshire. I am giving this thread a gentle nudge. It's the 100th anniversary of his death on Thursday. I have just stumbled across your post. I am curious to know what is your interest in William? William Paterson Jamieson (one p) was my great uncle. He was sniped while on tank reconnaissance the day before the start of the battle of Arras. Rather than use the communication trenches he used the road and accidentally wandered into no -mans-land. He died instantly.His orderly gunner Barr survived. I have done extensive research into his war. His service record, medal cards and his unit war diaries. I visited his grave at the British cemetery in Tilloy in 2016. I placed a ceramic poppy from the Tower at his grave. (I nominated him and his brother Nicol to be Included in the Roll of Honour read out at the Tower in 2014). His name was included on 19 Oct. A very moving ceremony. 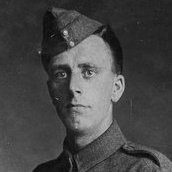 His poppy and his story are now held in the Carriere Wellington museum in Arras. I went to Arras for the centenary April 2017. A hugely emotional weekend. His war diary was tricky to find. Although MGC he volunteered to join the Tank regiment. He was a reconnaissance officer. Using his unit War Diaries and the fantastic maps held in the map room at Kew, I plotted the route he took on the night of 5/6 April 1917. I walked this route from Arras towards Tilloy in 2017. His CO Edmond - Forester- Walker wrote to his parents Alexander and Margaret Jamieson following his death I have a copy of this letter which is also is held by the Tank Museum at Bovington. FIO I also researched his elder brother Nicol Jamieson. He died in the " Vineyard" Gallipoli Peninsula 13 Aug. 2015. I followed his trail to Gallipoli in September 2018. He has no surviving grave. He is commemorated on the huge Helles memorial. Both brothers are commemorated on the War Memorial in Darvel, and on their family grave in Darvel. PS Let me know if you would like any further information. Thank you for posting. I am interested in all the Heavy Section, Heavy Branch, and Tank Corps men who died during and just after the war. Me and a small team have been trying to visit as many of the graves on or very close to the 100th anniversary of their deaths. And so William is theoretically of no more or no less interest than any other man from the Tank Corps. But as someone who is studying the Arras battles in some detail right now I am very interested to know a little more. I have seen the War Diary and the letter at the Tank Museum. If you have anything else I would be very keen to see it. WO 153/231 Arras objective and line held April 1917 - WO 95/104 3 Brigade Tank corps HQ Jan 1917 - Dec 1918 extract only. It is a very large document. I have extract copies of maps from the map room at kew. Plus lots of personal family records.photograph of his grave, his will and valuation rolls for property he owned. I am sure you will have much of these documents. I have been researching the two William Cleland GGC on the Darvel War memorial. Working with the In From the Cold Team to try to have William service no 4117 recognised as a casualty of war. He died feb 1919. There is no service record or record of discharge. He is buried in Darvel Old cemerery. Fascinated to read this information about William P Jamieson! Sue, thank you for this information. I'm sure we are probably distantly related as he is my ggreat Uncle. I have photographs of both William and Nicol which I have added to my ancestry tree (along with other family photos). If you wish more info please contact me. As regards William's death, I had no details, so this has filled in the puzzle. Many thanks for keeping William and Nicol's names alive.